At long last, some delightful new Japanese fabrics in the store! Linen, cotton, and double gauze! Make something super soft and sweet with these plush Cuddle fabrics! Autumn fabrics are arriving! These new sweater knits are perfect for a cozy and stylish layer! Kristin's latest project is this fabulous shift dress with wide, dramatic sleeves. Kristin altered the neckline to eliminate the tie and simply made a band that went all the way around. The pattern is from the July 2018 issue of Burda Style magazine. More fantastic new linen prints to enjoy! And a couple lovely new solids too! These new cotton prints have a delightful watercolor look! Our Fall & Winter 2018 Class Schedule is Now Available! We have plenty of fantastic classes to offer, from Beginning to Advanced levels. NEW classes with fun projects! The best sewing techniques to hone your skills! 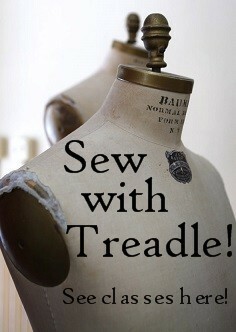 Sew all season long! This schedule runs from now through January! Sue made this drapey sleeveless top from a soft rayon challis with a simple, single-color print. The design is by Marcy Tilton, and features all her favorite elements: unusual piecing, artistically placed tucks, and an asymmetric hemline. The back is just as interesting, with more asymmetry and waistline tucks for a smooth, contoured fit. The pattern is Vogue 9317 by Marcy Tilton. Sleeve and neckline options keep it unique and versatile! Our new prints from Rifle Paper Co. are from their English Garden collection. This gorgeous floral print on cotton canvas is a stunner! The floral print is also available as a rayon challis. So soft, drapey, and wearable! These tiny floral prints all have a vintage feel. The soft cotton lawn is smooth and easy to sew, and a tiny print is easy to wear. Perfect for blouses, skirts, and dresses! These sheer, light knit jersey prints have a slightly slubby texture that's wonderful to the touch. These cotton blend knits are perfect for a quick, light summer layer! Some new rayon batiks for a soft summer project!